Whether you have a sore neck, aching back or joint pain, it is always a good idea to have a heating pad near you to relieve the pain. We looked at different microwavable heating pads and then put together a list of some of the best products on the market. Let’s start by listing the top 5, we’ll later go into the details of each one, giving you their features, pros, cons and what other people even thought about them. Now that we have outlined the top 5, let’s discuss them in a bit more detail. We will be mentioning important qualities present in each of these pads, their pros, cons, and what users had to say in general. Carex, Bed Buddy Body Wrap is the ideal heating pad for you if you have cramps, muscle aches, joint pain from arthritis, headaches, and hot flushes. Carex Bed Buddy Body Wrap is helpful in relieving you of stomach cramps, tired hands and feet even if you are a nursing mother. The body wrap is made with Velcro fastener which helps in securing the body wrap comfortably in different body positions. Carex Bed Buddy Body Wrap offers you both hot and cold therapy in relieving pain. It relieves you of pain in muscles and joints of shoulders, back, neck and knees. It uses moist heat which is recommended as a natural alternative to OTC medications. The moist heat serves as heat therapy and you can thus use it in treating chronic pain such as arthritis or fibromyalgia. It also helps to relieve tensed muscles, shoulders, back, and neck. Ensure you do not overheat, as microwave heating time varies. It is importat you do not leave the Bed Buddy unattended to while heating. To avoid daming your skin, always touch test the heating pad before use. It only needs to be warm, not hot. Carex body wraps around your body’s contour to stay safe. The Carex heating pad should be heated in the microwave for about 1.5 minutes and should not exceed 2minutes before it is applied to a wound area. However, if you want to make it hotter, you can put it in the microwave for a little longer, but no more than 2.5 minutes to avoid damaging the pad. You can use Carex heating pad also as a cold pack. If you have swelling or inflammation, you can put it in a freezer overnight and it will be ready in the morning. You can use this model as both a thermal and a wet wipe. Secure Velcro fasteners keep the pad in one place. The sophisticated Carex cushion design allows you to wrap it around any part of the body to relieve various types of pain with maximum comfort. Lint was able to gather on the cover of the block. Microwavable corn stuffed heating pad is specially made for both hot and cold therapeutic use. It’s perfect for you for kids and adult experiencing cramps, headaches, muscle aches, arthritis, pain and sports injuries. Original Caylees Creations Corn Bags ensures you of durability as they are made with triple stitched seams. It outer covering is removable and you can wash with washing machine. The outer shell is made of 100% cotton. The heating pad is made with purified wholegrain kernels which last longer than any other tested grain. These grains are mold and mildew resistant with no additional scents. To compensate for maximum heat or cold, it is designed with nearly 3 kg of dried corn.However, the weight is not too much or small for children. The corn volume provides more and suitable heating and cooling time. For therapeutic heat, put the entire corn bag in microwave for a few minutes. You can microwave for 2-3 minutes (depending on the microwave power). You can refrigerate it in your freezer to turn it into a cooler pack. Ensure you insert it in the the freezer bag before placing it in the freezer to keep the corn bag dry. Triple-stitched seams help with durability. 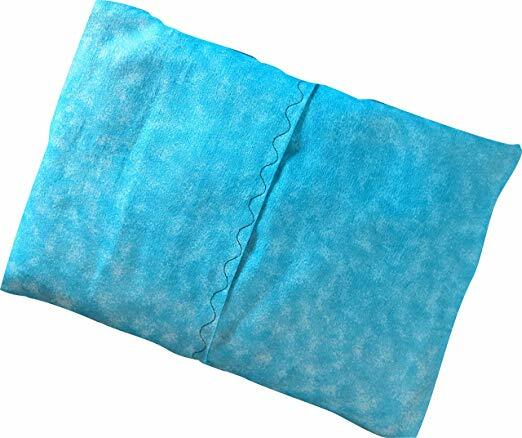 My Heating Pad Multipurpose heating pad gives you a a sensational and effective aroma experience as it is packed with high-quality lavender flowers. You only need to heat in the microwave for heat therapy. However, lavender scent can be a bit heavy when you first use it. It has an handle at each end for easily and convenient attachment to any part of your body. The product has a soft fleece on one side and cotton fabric on the other side. This multipurpose packaging is filled with a mixture of lavender flowers and rice. It is equipped with important functions to make it special and useful. 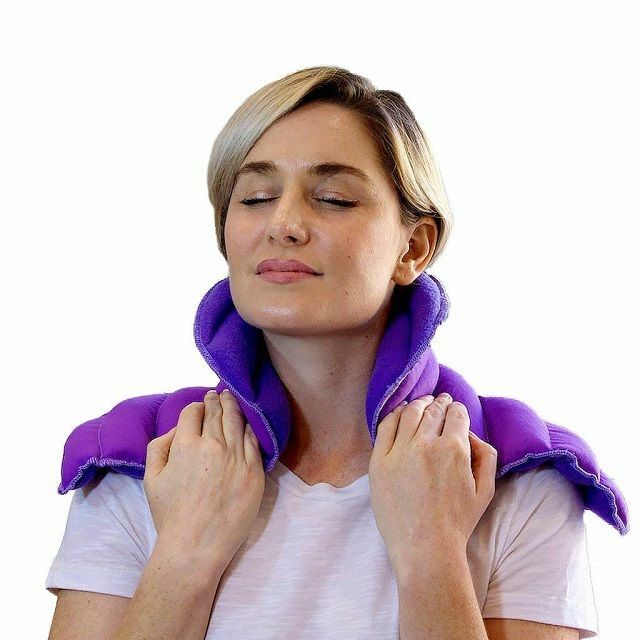 The combination of heat therapy and lavender in one product gives you added value over a normal heat pack. The health benefits of lavender flowers are well-known and varied: the lavender aroma has a relaxing effect on people and can often replace modern medicine with sleep problems such as insomnia. It has a soothing scent that makes it an excellent tonic for nervous and anxiety states. It can also be helpful in relieving headaches and migraines. The aroma of lavender flowers is a great remedy for various types of pain, including those caused by sore muscles, tight muscles, sprains, and joints. The heating pad allows you to treat large areas of the body at once. Two handles help you to keep the packaging in one place. This pad is comfortable to touch. Heats up quickly and keeps heat. Versatile to fit over multiple parts of the body. Some users find the pad too tight. The scent is overwhelming for some users. note that the heating pad has a very strong odor after first use. They notice that the strength of the fragrance fades, but it can be irritating to some users. 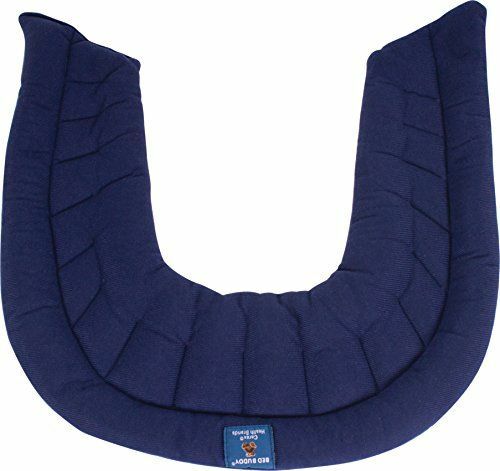 My heating pad neck and shoulder pack is developed by a chiropractor. It fits only into your neck, shoulders and upper back. It has 7 channels that distribute heat evenly throughout the pack. It puts a slight pressure on muscle weakness, aching joints, injuries, arthritis, tendinitis, stress, tension with a weight of just over 3 pounds. It is designed to have a soft fleece on one side and cotton on the other side. Features a unique tube design for even heat distribution. The model is completely odorless and thus the best choice for all types of odor-sensitive allergy sufferers. You can choose this heating pad in other colors. The pad is a bit heavy. Users prefer the product for its two sides – one for extra warmth and the other for extra comfort. However, there is a general complaint that it does not last as long as some other pads. Nature’s Aromatherapy Hot / Cold Packs give you a spa-style discharge at home or on the go. You enjoy the healing directly from nature as each pack is filled with special blend of 12 of Nature’s Best Herbs, including Lavender, Mint and Lemongrass. It offers you a soothing pain relief and soothing aromatherapy. It is made from natural organic materials that are 100% safe for humans, animals and the environment. The Basic Herbal Pack is made in a way to provide you with non-invasive therapy for head, neck, abdominal (menstrual), shoulder, elbow, knee, leg and foot problems. You can use it anywhere on your body. You only need to heat the herbal wrap in the microwave, then place it on the sore muscle or joint for quick relief. The humid heat and soothing scents of lavender, rosemary, mint and other herbs and grains help relieve pain so you can relax after a hard day’s work. The pack can be freeze and then use in reducing bruise, swelling, or muscle cramps. The natural herbal filling always ensures maximum relaxation as it also adapts to the contours of your body. Most users are satisfied with the price and smell, which also helps with a headache. The smell is initially a bit strong, but that disappears over time. What Is A Microwaveable Heating Pad? A microwave heating pad is a simple device that can relieve you of pain in different parts of the body. They can come in different shapes and sizes. Most common, however, are neck and shoulder wraps, pillows and body wrap. Typically, heating pads of this type are made with some heat-storing material and filled with either rice, wheat or barley. Some manufacturers make fragrant heating pads by adding lavender flowers in them. Needless to say, these pads require you to heat them in the microwave for a few minutes. Please note that thermotherapy can be very dangerous for people with certain medical conditions. How Long Do I Put A Heat Pack In The Microwave? The availability of different types of heating pads implies that people can choose the heating options that best suit them. There are DIY heating pads, electric heating pads, hot water bottles, chemical heating pads and microwave heating pads. Wrap it around your skull base to relieve headaches and migraines. It is effective for tension headaches and cluster headaches. Microwave heating pads can relieve your sore muscles both on your neck and shoulders. The concentration of heat in the area will lead to increased blood flow, facilitate relief and healing. Menstrual problems affect women all over the world. Place a microwaveable heating pad on the abdomen and it calms down the muscles that cause the pain. The back suffers the most from physical stress. For this reason, back pain is very common. Because a microwave heating pad is flexible, you can wrap it around your back to dampen the neurotransmitters that send pain signals to the brain. This will also relieve back pain and promote healing. The effectiveness of thermotherapy in pain therapy cannot be denied. People who live in chronic pain and those who want to reduce the symptoms of daily stress have many options, with the use of heating pads playing the major role. Microwavable heating pads are cheap, widely used and effective. The heating pad is easy to use. You can use it after putting it in a microwave and setting it to the lowest temperature. This type of heat is ideal for joint pain, muscle soreness, muscle tension and even arthritis. Unlike electric heating pads, microporous heating pads do not have the added discomfort of annoying tangled wires. You do not have to get stuck in a power outlet either. It is suitable for busy people who like to use it on the way. The ultra-comfortable packaging of microwave heating pads prevents burns and other heat-related injuries. Microwavable heating pads are soft and flexible. You can wrap them around problem areas such as shoulders, back, knees, etc. You can turn this type of heating pad into an ice pack by simply placing it in the freezer so it can be used frozen. A microwavable heating pad is very effective, it is a great heating option as it is cheap and available everywhere. The heat of a microwavable heating pad lasts twenty minutes, the time it takes to apply heat to any part of the body. Now that we have reviewed the best 5 microwavable heating pads, it is time to hear from you. Have you used any of these heating pads before? What was your experience? Kindly, let us know by leaving a comment, we will be very glad to update this review as much as we can. Bell's Palsy vs Stroke: What's The Difference? Will you be interested in reviewing my microwave PCM heat pack? My microwave heat pack can beat any other microwavable heat packs on the current market.